The air cleaner filter can be cleaned for inspection using compressed air. 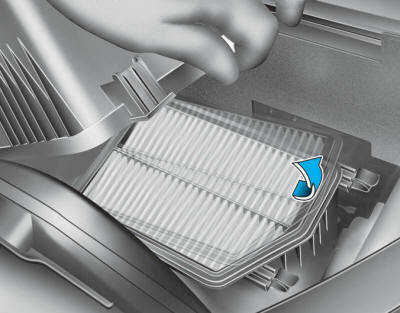 Do not attempt to wash or to rinse it, as water will damage the filter. If soiled, the air cleaner filter must be replaced. 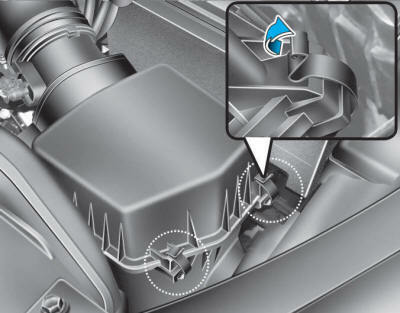 If the vehicle is operated in extremely dusty or sandy areas, replace the element more often than the usual recommended intervals (refer to “Maintenance Under Severe Usage Conditions” in this chapter). Do not drive with the air cleaner filter removed. This will result in excessive engine wear. Use HYUNDAI genuine parts, use of non-genuine parts could damage the air flow sensor.